Setting It Straight: Because of a reporting error, the original version of this article stated Royal Blue Grocery was open Saturday. It’s opening Monday. 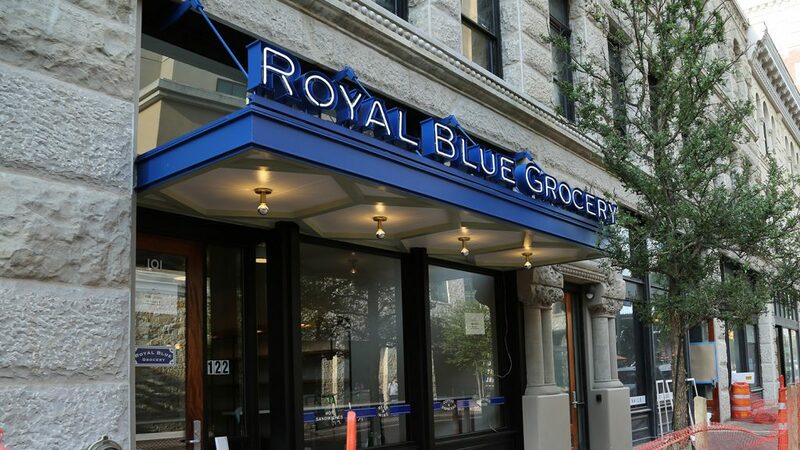 Royal Blue Grocery, the Austin-based bodega chain, is scheduled to open Monday in the Savoy building, 122 E. Houston St. Hours of operation will be 7 a.m. to midnight daily. The 3,000-square-foot store will offer grab-and-go items such as sandwiches and tacos, beer and wine, snacks, and other light provisions. Co-owner Craig Staley has said the company hopes to serve tech district employees, especially with start-up incubator Geekdom being located in the Rand building next door. He also sees guests from downtown’s many hotels using the store. The East Houston Street location will be the first for Royal Blue in San Antonio, but potentially not the last, Staley told the Heron last month. He said he envisions other locations popping up in downtown proper. “That’s definitely the plan as we see more things happening between downtown and the Pearl,” Staley said recently. Currently, Royal Blue has eight other locations—six in Austin, two in Dallas. Seating, roughly 5-6 tables, will be primarily outside on a raised patio. Staley said San Antonio wasn’t on the company’s radar until it connected with Weston Urban, the Savoy building’s owner, two years ago. He said he doesn’t see Royal Blue directly competing with H-E-B’s South Flores Market, which is roughly eight blocks south at Flores and East César E. Chávez Boulevard. Royal Blue is the first tenant to open in one of the five retail spaces on the ground floor of the Savoy. Next to the Savoy, Austin-based firm AMS Real Estate Services is planning a restaurant/retail/hotel complex in the Book, Clegg, Kennedy, Veramendi and what’s left of the old Solo Serve buildings. Weston Urban’s larger plans to resuscitate and repopulate west downtown, where it owns many parcels, includes filling the Savoy with retail tenants. But they don’t stop there. It’s co-building the new Frost Tower. It’s reshaping the former green space across from the tower into a park that will include a restaurant space occupied by Pinkerton’s Barbecue of Houston. And in the agreement between the city, Frost and Weston Urban, which has resulted in the new tower, it plans to build 265 residential units in the area.